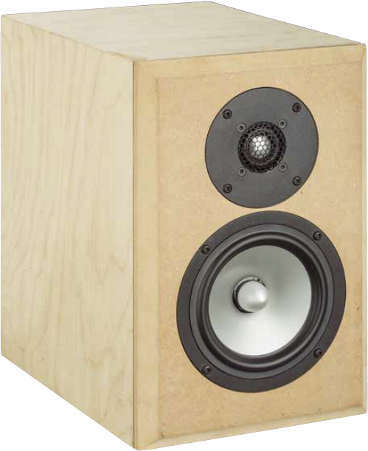 CT 288 is an compact speaker with drivers from Fountek, SEAS and Mission. The kit is delivered with a SEAS 22 TAF/G tweeter, a Fountek FW146 Woofer, and a Mission CP 168 as passive radiator. The Mission CP 162 must be tuned for the job as a passive radiator. With a angle grinder, the magnet must be cut from the basket. A round wooden part must be glued in the voice coil former to screw on weights. The spider must be partially cutted for a lower resonance frequency. CT 288 has been developed by Oliver Martin and Frank Zeppelin. The crossover consists of a 2nd order high-pass filter (12 dB per octave slope) for the tweeter. The woofer are connected to a 3rd order low pass filter (18 dB per octave slope). An RCL circuit in parallel to the woofer is smoothing the frequency response. The frequency response of this speaker is linear. The decay spectrum is nearly perfect. At low volume, i.e. 85 dB at 1 m, the nonlinear distortions are lower than 0,5% above 200 Hz and doesn't exceed 1% at 95 dB at 1 m .
Instead of Basotect damping material we deliver Bondum 800. The high-end kit is delivered with baked varnish air core coils for minimizing microphonic effects. - The current flow through the coil creates a magnetic field which sets the reel of wire in motion. This motion induces a voltage in the coil which adds itself to the signal. The stiffer the reel of wire is, the less the signal will be altered. All capacitors are of type polypropylen (MKP) and in series to the tweeter a Clarity-Cap ESA 250 V is employed.